The majority of the 30 neighbors or so who attended a meeting Thursday night for a new five-story affordable housing development on 24th Street seemed supportive. A handful, however, made it clear that they hate it. “As many units and as many people as you can house in this — I would support,” said Iris Biblowitz, a local resident. The project, located at the corner of 24th and Harrison streets in the Mission Girls building, would be reserved for low-income seniors. But some said the 55-foot tall project would create wind tunnels, exacerbate parking, and cast too much shadow. From their point of view, it was out of context for the low-lying commercial corridor. “If this thing goes up and totally wipes out my sun, it is going to destroy my life,” said Beth, a neighbor of the planned housing project on 24th Street. Beth, who did not give a last name, was one of several local residents who railed against the project. “It’ll take away sunlight and create vortex winds,” said another neighborhood. Still, the majority of those attending came out to defend the “Casa de la Misión” project saying squeezing more tenants into the property justified the height. The development is being spearheaded by Mission Neighborhoods Center, a neighborhood non-profit that owns the land and currently runs Mission Girls from there. That education program would be relocated somewhere on 24th Street during construction, said Sam Ruiz, the executive director of the non-profit. Mission Neighborhoods Center, which held the pre-development meeting at the site of the project at 3007 24th St., picked the California-based non-profit housing developer Mercy Housing to construct and manage the affordable housing. The project would contain some 40 studio units reserved for formerly homeless seniors likely making less than 30 percent of area median income or $22,600 for a single-person household. It would also have a ground-floor space for retail or non-profit use. Some hoped that Mission District seniors would have preferential access to the units. “Are you willing to consider and legally able to give preference to people that have been displaced out of this neighborhood by gentrification?” said Brooke Oliver, the founder and managing attorney of 50 Balmy Law, a law firm around the corner from the planned project. “We would love to do that,” said Barbara Gualco, a director of real estate development in San Francisco for Mercy Housing. Gualco said that while San Francisco has a law that reserves 40 percent of the units in fully affordable housing projects for local residents, that law is current being challenged by the federal government. The “neighborhood preference” legislation was approved by the Board of Supervisors in November 2015 but came under fire in mid-August, when the Department of Housing and Urban Development ruled that the measure violated federal housing guidelines. City and state officials are lobbying the housing department to change its stance, and Supervisor London Breed led a delegation to Washington D.C. two weeks ago to try and save the measure. If the federal housing department does not reverse course, it’s unclear whether this project will be able to reserve some of its spots for low-income seniors from the Mission District. 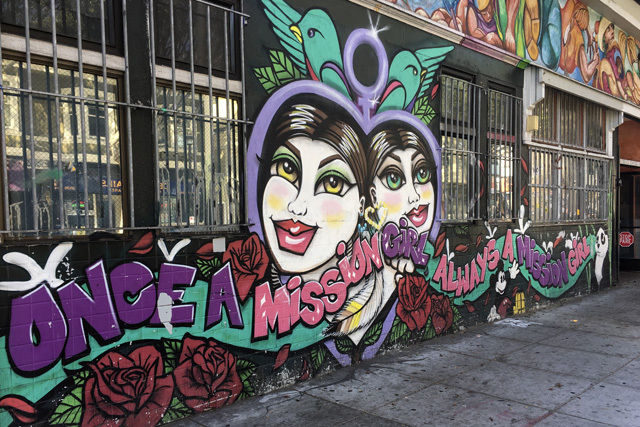 Mission Neighborhoods Center has owned the site since 1994, when it bought it from PepsiCo to prevent a Taco Bell from being built on the corner following neighborhood outcry. It has envisioned housing on the block since at least 2009, but is just now beginning the process in earnest. The project would be one of seven fully affordable housing sites in the Mission District that could bring in at least 632 units of below-market-rate housing to the neighborhood in the next few years. The other projects are at 490 South Van Ness Ave., 1950 Mission St., 2060 Folsom St., 1296 Shotwell St., 1990 Folsom St., and 2070 Bryant St. It would be the tallest building on 24th Street east of Mission Street, however, leading to concerns that it could start a rush to similar development in the area. A similar worry was raised at a meeting for the senior housing planned for 1296 Shotwell St. in May. Though other affordable housing projects in the Mission District have sought to break through height limits to squeeze in more units, Mercy Housing representatives said that the Casa de la Misión project would likely not seek to go above 55 feet because it abuts Balmy Alley. The setbacks required for buildings next to mid-block alleys, they said, would likely not allow for enough added units to make the financing pencil out on the change from wood to concrete construction, a prohibitive cost. The Mayor’s Office of Housing and Community Development is applying for $2 million in federal funds for the project, which could cost up to $50 million but likely less. City funds could make up 30–40 percent of the total funding, and developers would likely use a mixture of state and private funds for the rest of the project cost. Mission Neighborhoods Centers is planning to continue community meetings for the project through the end of 2017, when it expects to be approved by the Planning Commission. After that, the project would receive its final funding and could begin construction in December 2018. Beth, take your selfish “wipes out my sun” and shove it where the sun don’t shine. Subsidized luxury housing for a select few. BMR is just a carrot on a stick for the unwashed masses, that hunger for housing they will never get. Pimped to them by cunning ( or clueless ) politicians for their votes. Bob, what sort of housing deal would satisfy you? I am genuinely curious. Unless your real last name is Avakian.